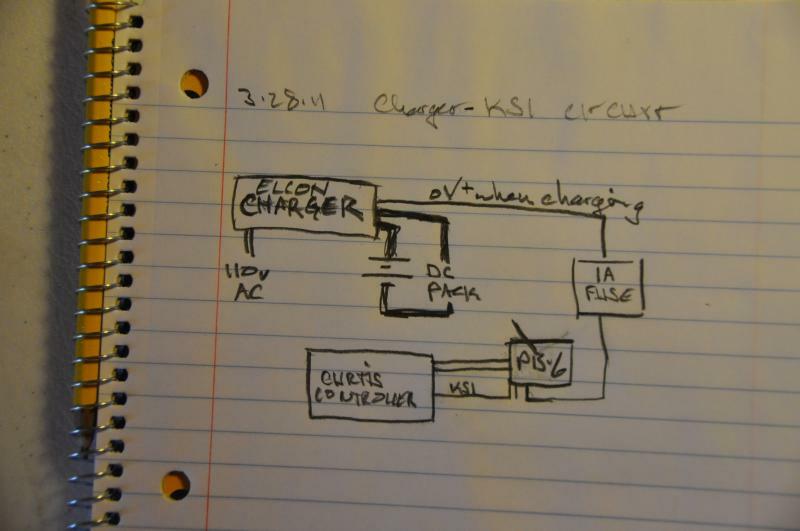 The Elcon PFC-1500 charger I am using now has an 'interlock output' lead that carries the pack + voltage when the charger is NOT plugged in, and 0 volts when plugged in.... perfect for wiring to the pb-6 potbox ksi voltage in, and then the usual ksi out to the controller ksi terminal. No more external relay required! This is a good feature to wire up to prevent driving off while still plugged in because the Elcon charger doesn't make a loud noise since it doesn't have a fan like my old Zivan did. UPDATE - 10/2011 I found out that this interlock output has a flaw... the pack voltage returns when the charge is complete even if it is still plugged in! So, not real effective for an interlock since the typical charge is done in the morning and you COULD drive away while still plugged in. so, if you want a SAFE interlock, you probably need to go back to a physical microswitch on the plug cover or fuel door to interupt your 12v key-on power to main contactor solinoid.